P1 – Practice intentional inquiry and planning for instruction. This means that classroom teacher plans instruction around a learning target and creates a lesson which encourages students to critically think about the function of the learning target. Within the realm of mathematics, students should build intuition around how mathematical processes and can therefore build from current understandings to unique situations in the future. For a teacher, building this intuition must be well planned. In the images, I’m presenting the work of a group of students who completed a group inquiry activity that was monitored me. While POGIL (Process Oriented Guided Inquiry Learning) activities are highly structured and I lack the training to adequately design a true POGIL, this is my best attempt at guiding students through mathematical concepts using discovery as the motivator for the lesson. This POGIL is about matrix multiplication, the purpose of this activity was to build on their prior experiences of matrices, create intuition about mathematical practices, and assist students in making meaning behind matrix multiplication. Many students know the procedure, yet few understood how this process was applicable in the real world. This classroom activity was built and designed by me, although I used a textbook to find problems with student interest in mind and adapted the questions to fit my instructional goals. Since this activity was designed by me, this demonstrates I am able to ask students good questions which lead to conceptual understanding. This also shows my ability to plan for 100 minutes of instruction and facilitate an activity, probing students for more advanced thinking. While planning this activity, I learned about how challenging it is to create clear questions which lead students to understanding of the learning targets. 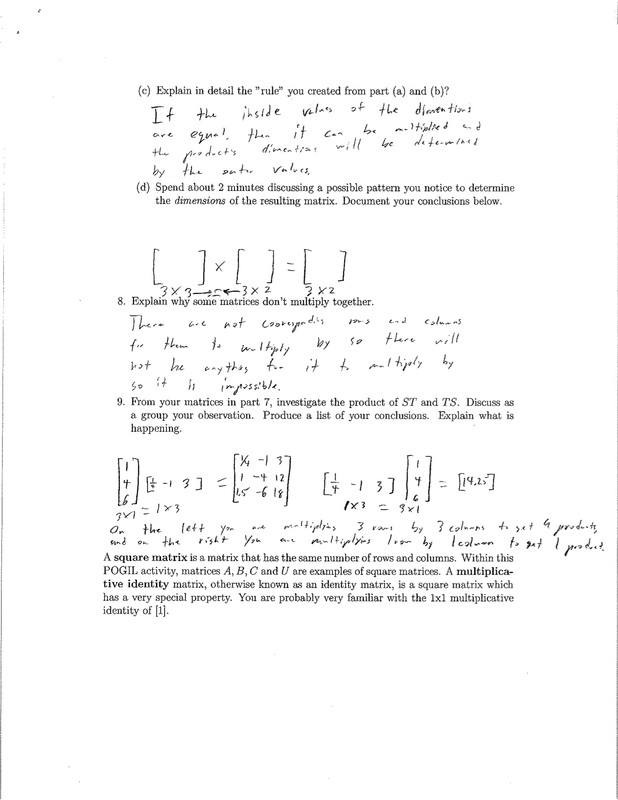 Since I teach multiple sections of the same course, after each class, I revised my questions to ensure each question challenges students and leads them to more complete understanding of matrix multiplication. Students also state they enjoy the POGIL’s as a learning activity. Students get to work in groups and ask questions to their peers. Providing group based activities, students break the routine of back to back 100 minute learning segments. Additionally, this provides students the opportunity to practice new skills without the traditional “drill and kill” of many math classroom. Practicing with inquiry also helps students create meaningful understanding rather than the process of symbol manipulation alone. When designing lessons, it may be useful within my lesson plans to prepare questions each day which probe at the students understanding. Also, I think that creating a classroom goal everyday (and actively writing it down in the lesson plan) will help lead to a meaningful result from the lesson. With a goal like “Students can understand the meaning and operations of matrix multiplication,” I can create quality lessons, ask questions which probe for understanding, and measure the effectiveness of my lesson. The Northwest Mathematics Conference (NWMC) is a gathering of educational professionals who teach math or provide assistance to math instructors. The purpose if for attendees to gain valuable knowledge around how to teach and learn the latest and greatest instructional tools for math classrooms. All grades and topics were covered, some general educational techniques and others were specific to integrating Common Cores State Standards (CCSS) or other instructional tools into the classroom. 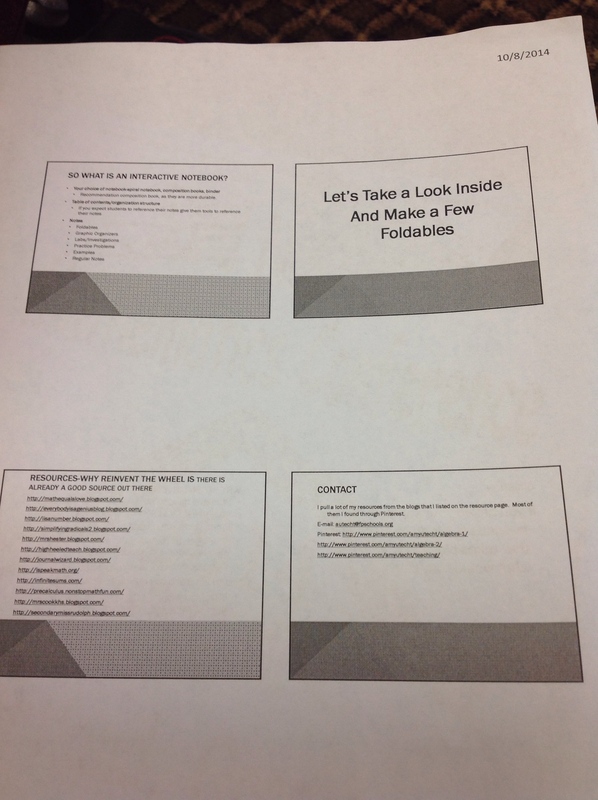 The linked document are the notes I took on day one of the math conference. These only include a little bit about the sessions and workshops I personally attended, however I obtained many resources throughout the conference and this document include many many references to learning tools. I will copy the session/workshop title and description and follow up with a few vital learning points. graphing, geometric representation, and more. The session with Mark and Chris taught us about visualization of mathematical concepts, this followed the Dan Meyer’s model for presenting information and creating debate. One of the most interesting pieces of their workshop was the visualization of square roots. Investigating the fundamental ideas behind square roots would help students understand how to simplify square roots. Squares have the same length on each side and a square root is the length of one side of the square. 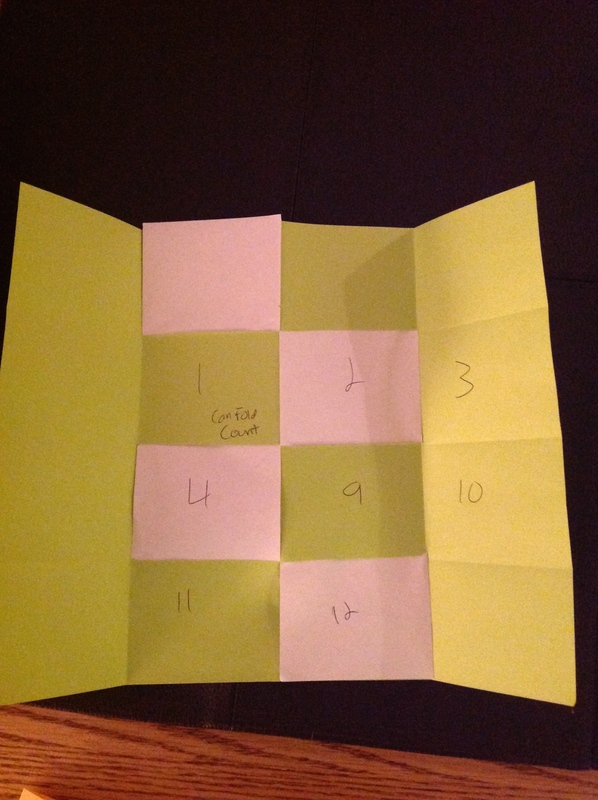 Participants were provided with a packet of multiple activities that helped students visualize math concepts. 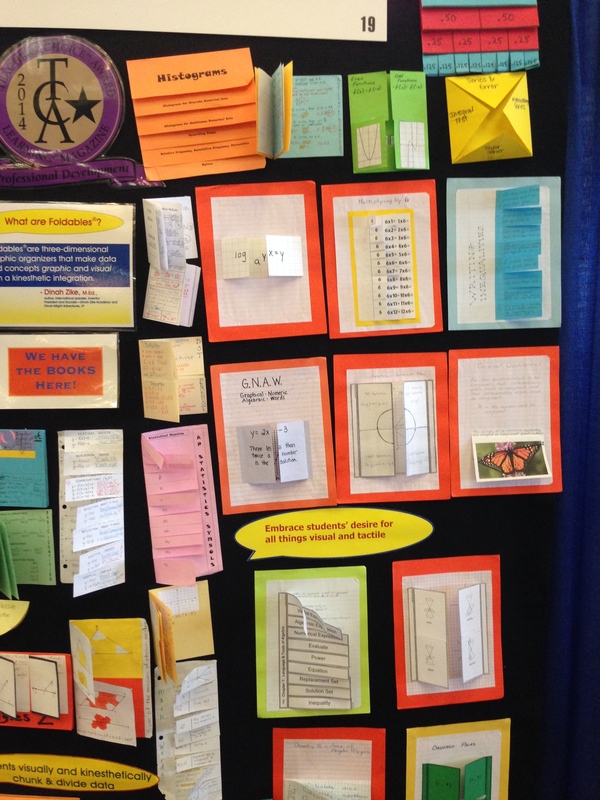 Come discover the world of Interactive Notebooks. I spent the last year researching and creating interactive notebooks to use with my algebra students. These notebooks include notes, foldables, examples, and journaling. I will share resources that I discovered and we will create several pages that were highly effective with my students. A consortium of school districts in Southwest Washington have design a curriculum aligned to the Common Core content and practice standards. We have rich tasks, fluency practice, formative and summative assessment, and professional development modules. Debra is a curriculum developer in Vancouver who received a grant to develop a curriculum around the common core for Algebra 1, Algebra 2 and Geometry. These are field tested activities and are FREE for any teacher to use. They obtained an open license to allow teachers to use the information for their classroom without additional credit. They have Algebra 1 published this year, next year they will publish Algebra 2 and later Geometry. This is a cool resource which focuses on BIG IDEAS for students and teachers. We try to engage students with math games, math rap, real world math problems, and promises of jobs later in life, but that engagement is often short-lived. The presenter will introduce Guershon’s Harel concept of “intellectual need” – a place where students need new math learning – and ground it with practical strategies. Again, the attached document if for day two of the conference and note I took during the conference. There are a lot of pictures in the document above. These sessions mostly had more visual elements to them. Again, I will comment on each session for important points and provide resources. 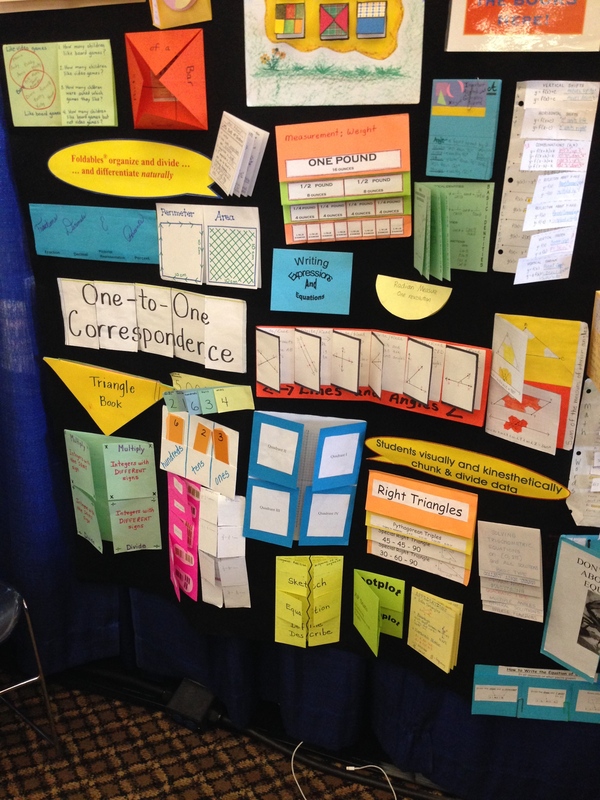 In this fast-paced session discover how to transform basic classroom materials and scafFOLD your math instruction using 3- D graphic organizers known as Notebook Foldables®. See the possibilities unFOLD and depart with a mini composition book filled with immediately usable ideas. This course taught teachers several visual aid and organization strategies to build concepts for an interactive notebook. 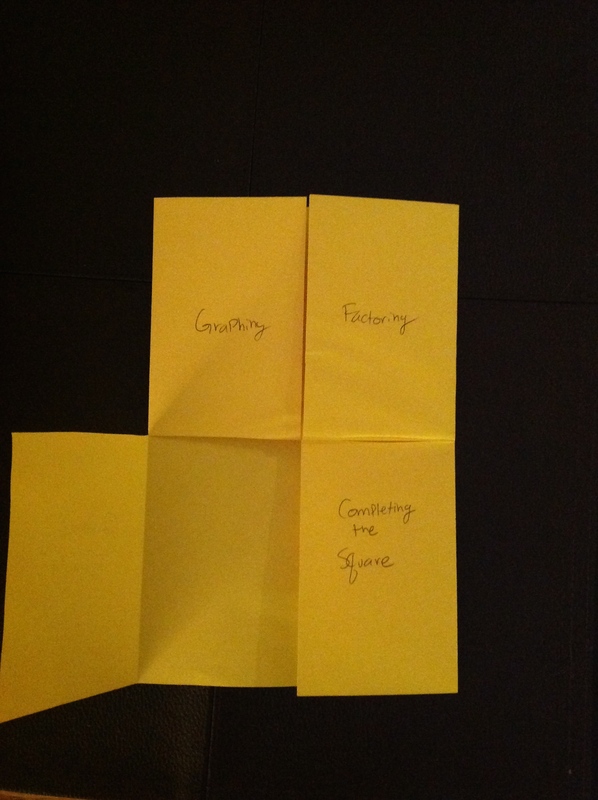 Foldable’s can be independent of a notebook page or can be pasted in. Some of the topics were elementary and were silly for high school students, but other tools could be easily adapted for any classroom or topic. Implement Standards Based Grading into your grading NOW – Including CCSS! Have you heard about standards based grading and are now ready to do it? This workshop will provide easy, practical strategies to implement standards based grading into your grade-book starting now – even include CCSS. Standards based grading is important for showing students where they are struggling and where they are excelling. Providing an area in the grade book is important to show parents which areas to work on. Additionally, this talk provided some ideas for classroom management. Katie teaching in a school district where students need to receive feedback on their homework, however the problem with collecting, grading and redistributing papers is a tedious effort on the part of the teacher. Students complete homework as requested and earn a daily score, homework complete (1 pt) or homework not complete (o pts.). 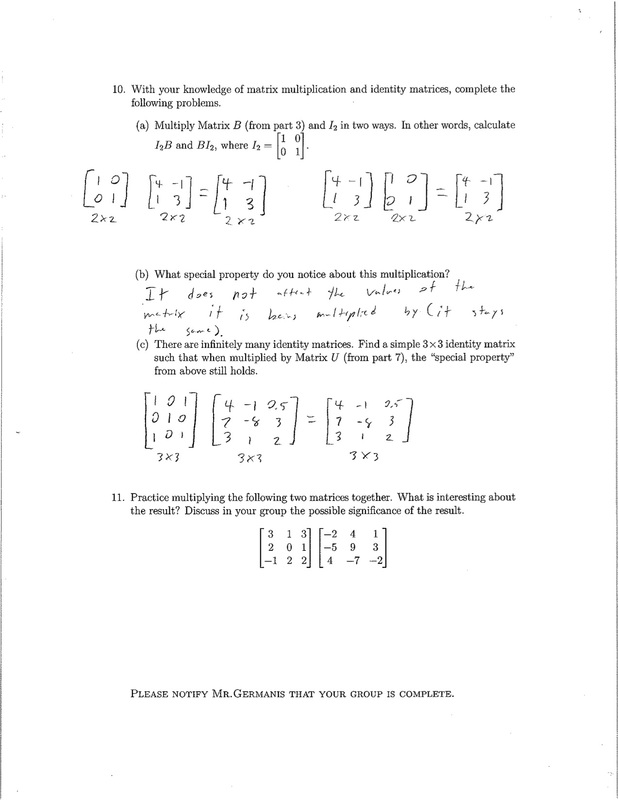 At the end of a 1.5 week period, the class has a quiz on a characteristic homework problem. At this time, Katie collects homework packets from the past week and grades a the homework quiz and homework problems. The students may use homework notes on this quiz. The primary focus of the talk was standards based grading. 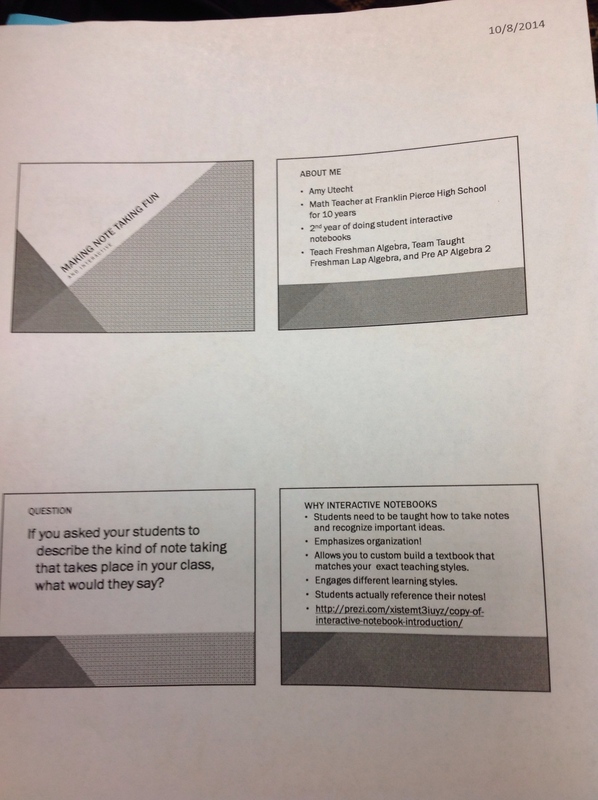 Katie shared her approach and grading scale for students for tests, quizzes and projects. Students can earn up to 55% by making an effort. Providing student points for effort encourages work, but does not deteriorate their grade to the point of no return. Students can revive themselves from a bombed test or misunderstanding. Incorrect thinking still results in a non passing score, but they still have a chance at learning the information and encourages continued effort. Another take away from this talk was the style of grading for tests. Each test contains several standards, a grade is assigned to each standard and that is placed into the grade book. For one test, there may be up to four grades. For example, the grade book may read Chapter 4 Test: Solve Equations, Chapter 4 Test: transformation equations and so on. This allows students and parents to really focus in on problem areas. Creatively implement these exceptional activities into your classroom – Geometry through Calculus. Discover how to create individualized problems – unique to each student – and how to create individualized answer keys including all intermediate answers to easily assess these individualized problems. This lecture was provided to help teachers provide challenging problems, primarily focused on the higher level math classes such as precalculus and calculus to create individualized problems. The secret, a spreadsheet with the answers. While Tom grades based on correctness of each step along the way, each problem should be displayed as an organized piece of work. Tom also talked about classroom strategies when presenting these challenging problems to his classes. He allows students to work together and carefully watches as students work to problem solve. He takes a hands off approach and lets the students figure out the problems. He provided resources for us to use in our classroom through his dropbox. Overall the math conference was excellent, I learned about many application tools which aligned with my university learning. I would highly recommend professionals to attend this event to learn about what other teachers are doing in their classrooms. After many sessions I walked away with great excitement about how I could implement this in my classroom, even adjust the procedures of the classroom for my internship to help students needs. I would have liked to see more research being contributed to some of the lectures (such as Dan Meyer’s Lecture) however I think many of the presenters at this conference were genuine in their interest to help students and improve other’s pedagogy for teaching math. 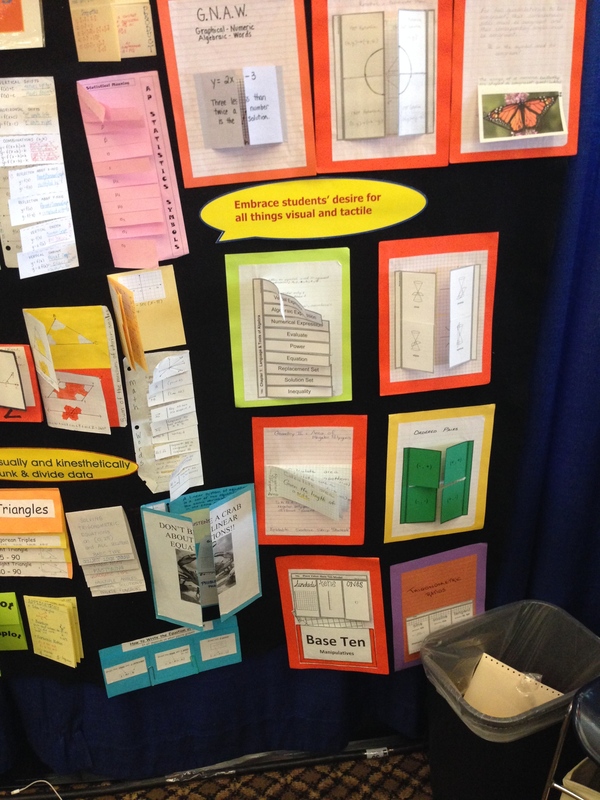 Interactive Student Notebooks, similar to what we do in class, but modified to provide more structure. Essentially creating student created textbooks in a journal. Dan Meyer presented about introducing mathematical concept in an engaging way that doesn’t necessarily have application, but makes students think about an interesting question. This provided some resources for unmotivated students who don’t typically engage in classroom activities alone. Standards based grading, breaking down assessments and assignments into chunks of what we want students to understand and enter these into the grade book separately. This allows students and parents to clearly see which concepts the student is struggling to understand. So when Student A gets a 75% on a test, he may have gotten 100% on combining like terms questions, but 60% on factoring trinomials. Graphic organizers for less organized students or students who are more into art. One class structure is to teach organizational tools and study tools to students who need them.